Martin Luther King was a great leader but he was also a great writer. 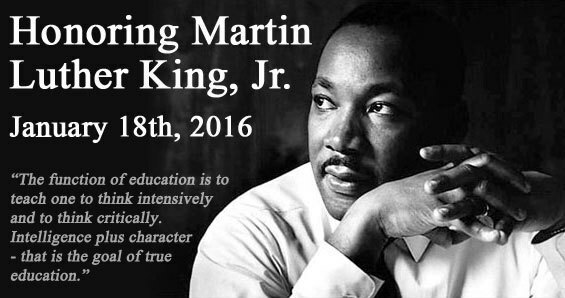 To celebrate his birthday, students can study his 1963 Letter from an Alabama Jail as part of a lesson that focuses on the organization of text. Read Dr. King's words, and the works of others, in Thinkport’s Conflict and Peace in the 20th Century World. Exciting changes are coming to Thinkport on March 1! Educators and families can look forward to a contemporary new design, improved site navigation, and mobile access. To make room for the updates, some of the older tools will be phased out. Please visit our Thinkport Updates page for additional information. January 17 is Kid Inventors' Day. Encourage your students to think outside the box as they learn how other students use the design process to make their inventions a reality. Visit PBS LearningMedia’s Young Inventors to share stories from inventive youth. Explore it, build it! Watch your middle school students’ imaginations soar on Math by Design as they design a virtual park and environmental center using geometry and measurement. Students learn valuable math skills doing real-word tasks such as placing a pond in a park and adding obstacles to a fitness course.